Esmail Abdi, a leader of the Tehran Teacher Trade Association sentenced to six years in jail on bogus charges, has initiated a hunger strike on 30 April to protest the continued, unlawful repression of teachers and human rights defenders and the lack of independence of justice in Iran. Abdi is kept in harsh detention conditions and denied communication with his family and lawyer. This hunger strike is taking a toll on Abdi’s health, and even putting his life in serious danger. Prison authorities have not reacted to any of his demands. 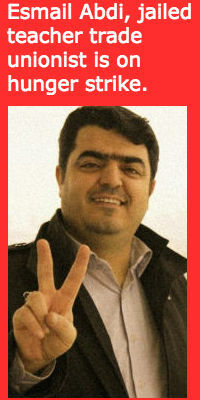 We need your support to urge the Iranian authorities to release Esmail Abdi. "Iran, suspended democracy"- . With Dominique Marlet from the Education International. Aired on RadioArticolo1.